The International Organization for Septuagint and Cognate Studies (IOSCS) is a nonprofit, learned society formed to promote international research in and study of the Septuagint and related texts. By the term Septuagint is meant the ancient translations of the Hebrew Scriptures into Greek, including both the translation of the Pentateuch and that of the other books of the “Alexandrian Canon.” By the term cognate studies is meant the study of the ancient translations made from the Septuagint (“daughter versions”) and the so-called apocryphal and pseudepigraphical literature circulating around the turn of the era. Individuals and institutions with an interest in the Septuagint and related materials are welcome as members in the IOSCS. For more information about membership, please follow this link. The IOSCS publishes an annual journal. Through issue 43, this publication was known as the Bulletin of the International Organization for Septuagint and Cognate Studies (BIOSCS). 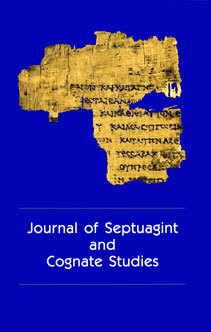 With issue 44 (2011), the name became Journal of Septuagint and Cognate Studies (JSCS). Articles submitted to the journal are double-blind peer-reviewed by multiple scholars. To safeguard the integrity of the peer-review process, the names of reviewers are not published or made known. The current Editor is Siegfried Kreuzer, Protestant University Wuppertal/Bethel, Wuppertal, Germany. All current members and subscribers receive the Journal. Follow this link to become a subscriber or to renew your subscription. The first 43 volumes of our Journal are available online in PDF form. Under the auspices of the Society of Biblical Literature (SBL), the IOSCS publishes a monograph series, refereed by its Editor (a member of the Executive Committee) in consultation with other scholars at the Editor's invitation. The current editor is Wolfgang Kraus, and the editorial board is composed of Karen Jobes, Rob Hiebert, Siegfried Kreuzer, Philippe Le Moigne, and Arie van der Kooij. In response to questions about the best available critical editions of the Septuagint or Old Greek for use in scholarly discussion and development, including electronically based research, the Executive Committee of the IOSCS offers recommendations. New translations of the Septuagint into modern languages have become available in recent years. A New English Translation of the Septuagint (edited by Albert Pietersma and Benjamin G. Wright) is available from Oxford University Press. Septuaginta Deutsch: Das griechische Alte Testament in deutscher Übersetzung (edited by Wolfgang Kraus and Martin Karrer) is available from the Deutsche Bibelgesellschaft. Natalio Fernández Marcos and María Victoria Spottorno direct this project. The nineteen volumes of La Bible d’Alexandrie (edited by Marguerite Harl, Gilles Dorival, Olivier Munnich and Cécile Dogniez) have been published by Les Editions du Cerf, Paris. Also see the related website, Le Carnet de recherches La Bible d’Alexandrie: Version grecque des Septante. A critical edition of the first Romanian translation of the Septuagint, by Nicolae Spătarul Milescu (1636-1708), has been published: The Old Testament — The Septuagint: Nicolae the Spathar Milescu’s Version (Ms. 45 from the Library of Cluj Branch of Romanian Academy) , edited by Eugen Munteanu (coordinator), Ana-Maria Gînsac, Ana-Maria Minuţ, Lucia-Gabriela Munteanu, Mădălina Ungureanu (The University „Alexandru Ioan Cuza” Printing Press, Iaşi, 2016). The following projects are conducted under the auspices of the IOSCS. The International Organization for Septuagint and Cognate Studies (IOSCS) offers an annual prize of $350 to be awarded to an outstanding paper in the field of Septuagint studies. The prize has been named in memory of John William Wevers to honor his many contributions to the field of Septuagint studies. More information is available. The deadline for submissions is August 15 of each year. IOSCS has a Facebook Page. Visit for periodic announcements and posts of interest. "Biblical Poetry: the Legacy of the Psalms in Late Antiquity and Byzantium" will be the subject of a colloquium organized by Reinhart Ceulemans and others at Ghent University, 23–24 April 2020. In preparation of a volume on the reception of the Psalms in their Greek Septuagint translation from Late Antiquity and Byzantium, the organizers invite scholars of all levels of experience to present a 20-minute paper at the colloquium. The deadline for proposals is 31 May 2019. Visit the Psalms 2020 colloquium website and especially its Call for Papers for details. The next International Meeting of the IOSCS will be held in Aberdeen, concurrently with IOSOT. The IOSCS meetings will be scheduled on the afternoons of 5th, 6th, and 8th of August, 2019, with a business meeting in the late afternoon or early evening of Thursday the 8th. The main theme of the IOSCS meetings will be “The Septuagint in its Hellenistic Jewish setting,” encompassing questions of history, textual development, interpretation, religious outlook, cultural context, and lexicography. Papers relating to this theme will be especially welcome. However, papers on other subjects will also be considered. Both the IOSCS projects (NETS, Hexapla, LXX.D, SBLCS) and other allied groups (e.g. HTLS, Göttingen volume editors, La Bible d’Alexandrie) are encouraged to offer panel sessions, either on the conference theme or on aspects of their current work. Joachim Schaper wishes all proposals from sister organizations to go through the IOSOT Aberdeen site. IOSOT will send the proposals on to IOSCS in due course. Registration and accommodations may also be arranged through the IOSOT Aberdeen site. The Associated Canadian Theological Schools of Trinity Western University and the John William Wevers Institute for Septuagint Studies have announced their Septuagint Summer School course for 2019. The course, “The Septuagint, Translation & Jewish Scribalism” will be taught by Dr. John Screnock, Research Fellow in Hebrew Bible, University of Oxford. It is scheduled to take place June 24-28, 2019, from 8:30 am to 12:30 pm (Pacific Daylight Time). See flyer (PDF) for more information. A new reader’s edition of the Septuagint will be available in November (and can already be pre-ordered!). Edited by William Ross and Gregory Lanier, it includes the entire Septuagint (the text is that of Rahlfs-Hanhart). To facilitate reading, each page is annotated with lexical information. More information is available from Christian Books. The Annual Meeting of the SBL will be held in Denver, Colorado, 17–20 November 2018. See details. For the convenience of European members, we have made arrangements to receive subscription dues in Euros. Volume 50 (2017) is currently in press. See the table of contents or download a PDF of table of contents and editorial. We've recently added ten more issues of our Journal to those available online. Issues 1 through 43 (1968-2010) are available. Our colleague, Peter Flint, passed away suddenly and unexpectedly on Sunday, 3 November 2016. Needless to say, this is sad news and a great shock to all who knew him as a friend and as a colleague. "Natalio Fernández Marcos is one of the foremost Septuagint scholars in the international scene. While his work is primarily relevant to biblical studies, he has also written about such subjects as Hellenistic Judaism and the history of scholarship." Professor Fernández Marcos is Profesor Vinculado ad Honorem at the Consejo Superior de Investigaciones Científicas, Centro de Ciencias Humanas y Sociales, Madrid. He co-directs the Biblia griega project. Ediciones Sígueme of Salamanca has published the final volume of their Spanish translation of the Septuagint: La Biblia griega. Septuaginta. IV. Libros proféticos (Salamanca: Sígueme 2015). The Göttingen edition of Second Chronicles (Paralipomenon II, Volume 7,2), edited by R. Hanhart, is now available. Ordering information is available for both the printed edition and the e-book. Hans Ausloos and Bénédicte Lemmelijn have edited a Festschrift for Marc Vervenne: A Pillar of Cloud to Guide: Text-critical, Redactional, and Linguistic Perspectives on the Old Testament in Honour of Marc Vervenne . It is available as volume 269 in the Bibliotheca Ephemeridum Theologicarum Lovaniensium series from Peeters. The Göttingen Septuaginta-Unternehmen, home of the Göttingen editions of the Septuagint, has announced two initiatives of interest to those dealing with textual criticism of the Septuagint. (1) One of the tasks of the Septuaginta-Unternehmen is to manage the Rahlfs-sigla that are used to refer to Septuagint manuscripts in our edition and in several other publications. Since new manuscript witnesses keep on being identified, the collection of Rahlfs-sigla constantly needs to be expanded. In December 2012, the institute posted a PDF file with the up-to-date list of Rahlfs-sigla on its website, freely available to the public domain. (2) Several of the older volumes that have appeared in the series “Mitteilungen des Septuaginta-Unternehmens” are no longer available in print. To meet the wishes of the scholarly community to maintain access to these publications (among them, Rahlfs’ Verzeichnis ), the Septuaginta-Unternehmen has published a free PDF scan of the first four volumes on its website. These resources are available in the Septuaginta-Unternehmen's new website, which is available in both German and English. Christian Schäfer, a research fellow of the Septuaginta-Unternehmen in Göttingen, has written two manuals to allow both beginners and specialists to use the Göttingen editions of the Septuagint in an improved way. Above all, they explain in detail the structure and language of the apparatus of the editio critica maior. The first volume deals with the editions by J.W. Wevers. It is also available as an e-book. The second volume deals with U. Quast's editions. Septuaginta Deutsch. Erläuterungen und Kommentare zum griechischen Alten Testament , vol. I and vol. II, ed. by Martin Karrer and Wolfgang Kraus (Stuttgart: Deutsche Bibelgesellschaft, 2011). For previous news and announcements, please consult our news archive.